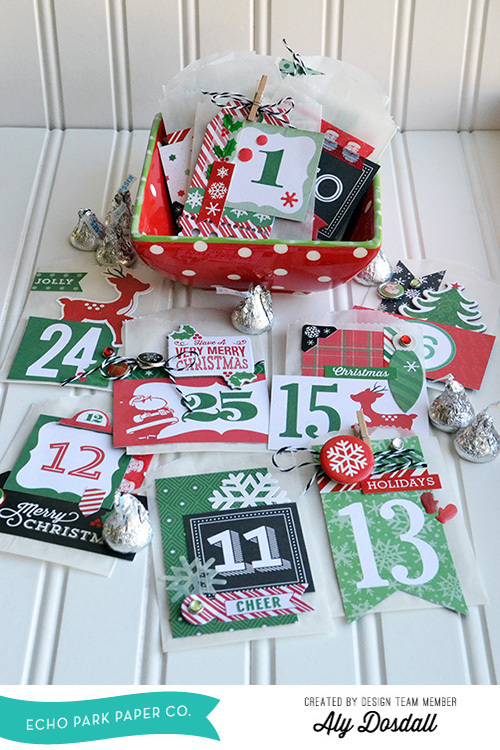 Aly Dosdall: day 24: make a christmas countdown + a giveaway! day 24: make a christmas countdown + a giveaway! Every year after Thanksgiving is over one of our favorite family traditions that weekend is to pull out all of our Christmas decorations and deck the halls of our home. Part of that hall-decking includes preparing and displaying our Christmas Countdown. My kids love the tradition of our Christmas Countdown, so I thought I would share that tradition with you! You can view this entire post on the Echo Park Paper blog HERE. Countdowns come in many shapes and sizes, but this year I decided to make mine by decorating some glassine bags with papers and embellishments from the Christmas Cheer collection. When I saw the Christmas Countdown paper I knew exactly what I wanted to do with it. I cut out the countdown cards and attached them to the glassine bags. I love that the cards are different sizes creating a more eclectic feel to the countdown. 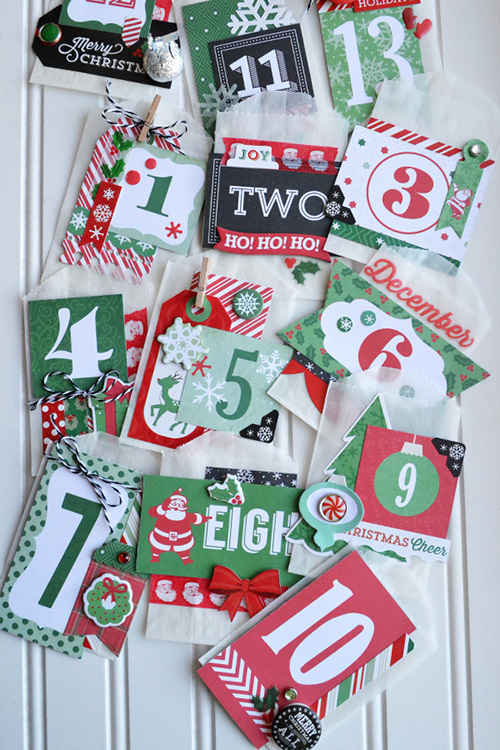 I used the gorgeous Christmas Cheer embellishments (chipboard accents, decorative brads, decorative tape, enamel shapes, and flair buttons) to decorate the countdown bags. 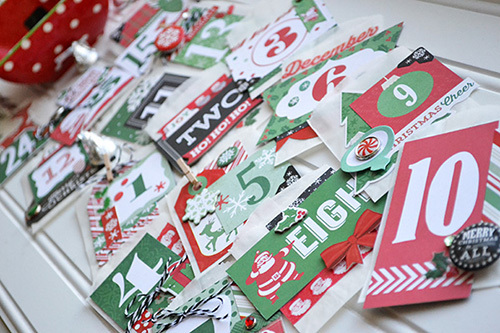 All the different types of embellishments add great dimension and visual interest to the countdown. While goodies are always a part of our countdown tradition, this year I tried to minimize the sugar and fat by including treats like sugar-free gum, all-natural fruit snacks, and dried cranberries. We also add advent scripture verses that we read together each night as a family by candlelight. You could tuck in some fun seasonal activities like watching The Grinch, baking and decorating cookies, donating change to the Salvation Army, creating teacher gifts, or making peppermint hot cocoa. I've got another beautiful Echo Park Paper holiday collection kit, Home For The Holidays, to give to one lucky reader! If you'd like to be considered for this giveaway, head over to my Facebook page HERE and "like" it if you haven't already. Then come back and leave me a comment letting me know that you've liked my page (or that you already had) and I'll select one random winner that I'll announce on Friday morning. Comments will remain open until Thursday at midnight MT--good luck! I "like" your facebook page ....and love your blog! I liked your facebook page. Love the countdown. Thank you for the chance to win. I love Christmas countdowns! Thanks for the chance to win! I "liked" your facebook page. And thanks for the giveaway! I liked your Facebook page. I LOVE the countdown!! Too cute! i just liked your facebook page and would like to thank you for this fun give away!!! That's a really fun countdown! I "liked" your page. Love your work, Aly! Thanks for this chance to win!